Maintain your fitness with rides through the park, around town or to work on the fully redesigned, women-specific Alysa series. 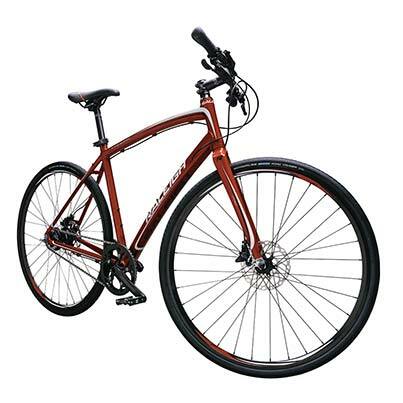 At an entry level pricepoint, there is no barrier to comfortable, functional fitness riding on the Alysa 1. A Shimano Revo Twist 7-speed drivetrain encourages riders to add inclines to their route for faster fitness results. The graphics and colors for the Alysa’s were created by a woman and selected by our female feedback panel. Today, these bikes represent a new level of women’s feedback, influence, and enthusiasm for the Raleigh brand. All 2014 Cadent and Alysa frames received updated geometries for a better fit and feel. One of the highlights is the slackened seat angle. This shifts the rider’s center of gravity back and takes some weight off the handlebars. The result: reduced strain on wrists, elbows, neck and lower back. We know that all parts on a bike are interconnected, this is why we switched to a 27.2mm seatpost and a new ergonomic grip. The smaller diameter post is both lighter and more compliant, and our new ergonomically shaped grip is a perfect match for your hands. These three seemingly small details all add up to make your rides more comfortable and more enjoyable. Simplicity, low-maintenance and reliability are all things that represent Shimano’s internally geared hubs. Shifting is silent, instant, and precise. With these internally geared hubs, there is no cross chaining, no missed shifts and no dropped chains. Instant shifting comes natural to internally geared hubs; you can even change gears without moving the pedals. Low cost replacement parts, care free maintenance and less hassle are a great combination on a bike used every day for commuting. If you just want to be able to grab a bike and go without having to worry about tuning the gears before every ride, Cadent and Alysa won’t let you down. "But I Won't Have Enough Gears!" The biggest misconception is that internally geared hubs have nowhere near the same bandwidth as a traditionally geared 3x9 drivetrain.This is where our love for data comes to the rescue. 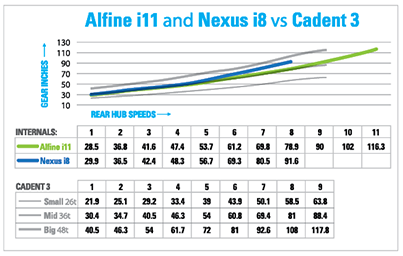 We created gear inches graphs to compare internally geared hubs against traditional drive trains.The 11 gears of Alfine i11 covers 24 of the traditional 27 speeds. If the gears aren’t working for you it’s easy to customize the gear ratios to your specific needs. Whether its up, down or flat, Shimano’s internally geared hubs will work for you.